> Ginny Girl and Karen in Sun Valley, Idaho during Thanksgiving vacation (2005). We were chasing chukars with my brothers. We had a great day with numerous points…although the gunners couldn’t shoot straight. 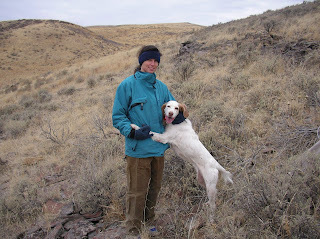 This photo of Ginny retrieving a scaled quail was from her last season (Fall 2006) in Kansas. We moved 20 coveys of scaled quail that day. Ginny Girl was a stylish bird finder and a reliable retriever. She’ll be forever missed.